Posted: January 13, 2016 11:08 p.m. Updated: January 13, 2016 11:08 p.m.
Southern California forward Nikola Jovanovic (32) gets past UCLA forward Tony Parker (23) as he drives to the basket Wednesday at Pauley Pavilionin in Los Angeles. 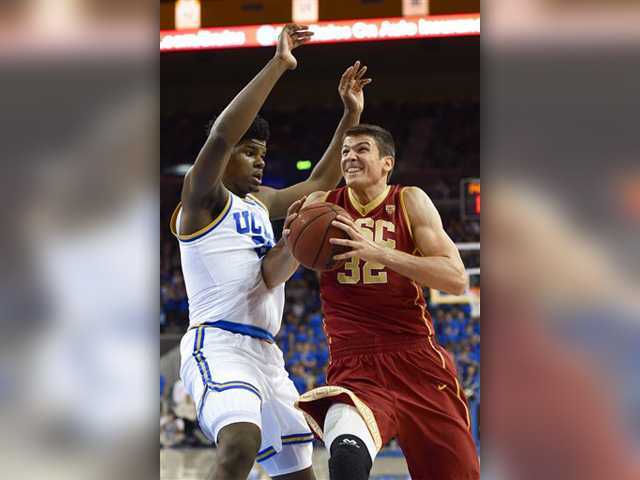 LOS ANGELES (AP) — Jordan McLaughlin scored 23 points, hitting five 3-pointers, and Southern California defeated UCLA 89-75 Wednesday night to end a six-game skid against its crosstown rival. Chimezie Metu added a career-high 21 points on 8 of 10 shooting and Katin Reinhardt had 14 points for the Trojans (15-3, 4-1 Pac-12), who are off to their best start in league play since going 5-0 to open the 2001-02 season. Tony Parker had 27 points and 12 rebounds for UCLA (11-7, 2-3). Thomas Welsh added 16 points and Isaac Hamilton had 10 rebounds for the Bruins, whose 12-game home league winning streak was snapped. Bryce Alford, who was averaging 17.4 points, was held to nine after being named Pac-12 player of the week. The Bruins trailed by 21 points early in the second half when they ran off 11 in a row to close to 58-48. Parker began and ended the run with baskets sandwiched around a 3-pointer by Aaron Holiday. Julian Jacobs scored six of USC's next 10 points to push the team's lead to 68-53. The Bruins outscored the Trojans 16-10 to cut their deficit to 78-69, getting under single digits for the first time in the second half. McLaughlin answered with his third 3-pointer of the half and USC led 81-69. The Bruins didn't get any closer the rest of the game, with the teams fouling in the closing minutes. UCLA opened the game with a 17-13 run, including eight points by Parker. The Trojans responded by outscoring UCLA 35-13, including 12 straight points, the rest of the half to lead 48-30 at the break. After the Bruins' initial flurry, they were held to 4 of 20 shooting in the final 11 minutes.